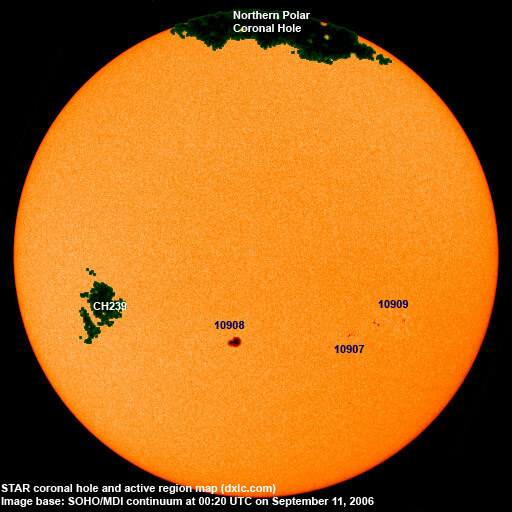 Last major update issued on September 12, 2006 at 02:35 UTC. The geomagnetic field was quiet to unsettled on September 11. Solar wind speed ranged between 326 and 388 km/s (all day average 351 km/s - increasing 4 km/s over the previous day). A weak disturbance was in progress during the first half of the day. Solar flux measured at 20h UTC on 2.8 GHz was 84.6. The planetary A index was 8 (STAR Ap - based on the mean of three hour interval ap indices: 8.5). Three hour interval K indices: 33322101 (planetary), 33322112 (Boulder). Region 10908 was mostly quiet and stable. 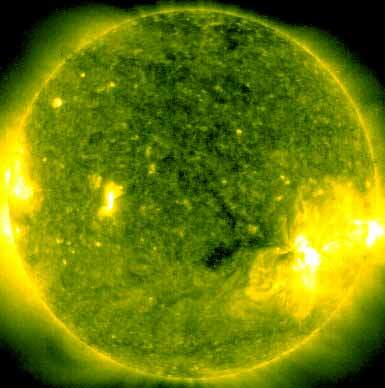 Flare: C1.0 at23:09 UTC. Region 10909 decayed further and could soon become spotless. September 9-11: No obvious partly or fully Earth directed CMEs were detected in incomplete LASCO imagery. The geomagnetic field is expected to be mostly quiet on September 12-15. 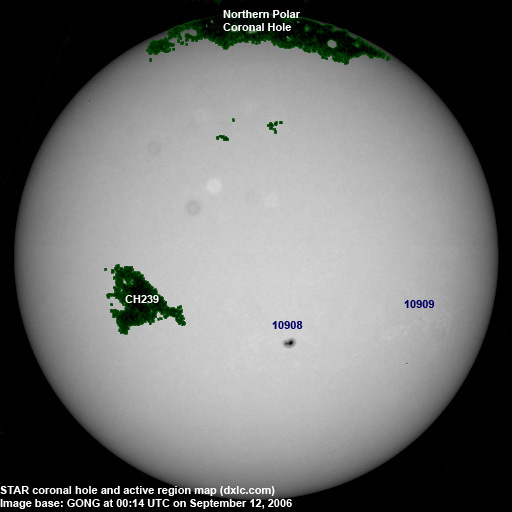 Coronal hole effects are likely on September 16-17. Long distance low and medium frequency (below 2 MHz) propagation along east-west paths over high and upper middle latitudes is good. Many stations from the eastern US and Canada were audible during the night (after 2330 UTC)with the best signals coming from the northeastern USA. 1060 WBIX, 1390 WEGP and 1470 WLAM were all heard with excellent signals. Propagation on long distance northeast-southwest paths is very poor.